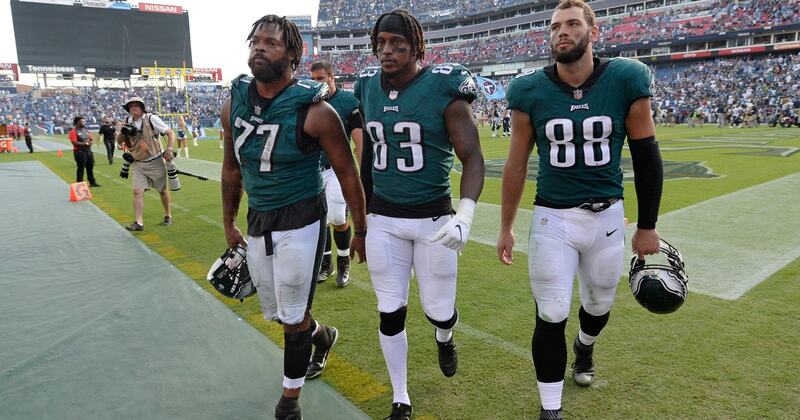 NASHVILLE, Tenn. (AP) — The Philadelphia Eagles are the healthiest they’ve been with now both Carson Wentz and wide receiver Alshon Jeffery back in the lineup. Getting the timing and chemistry back might take a little bit more work. The Eagles blew a 14-point lead midway through the third quarter and still had chances at the end of regulation and in overtime, needing a touchdown to win but settling for a pair of field goals that weren’t enough Sunday in a 26-23 loss to the Tennessee Titans . “It’s frustrating, obviously, to come up short, especially as an offense when you have chances,” Wentz said. Philadelphia (2-2) outgained Tennessee 432-397. Wentz threw for 348 yards and two touchdowns, and Jeffery finished with eight catches for 105 yards and a TD in his season debut . Zach Ertz led the Eagles with 10 catches for 112 yards. The Eagles led 10-3 at halftime, 17-3 midway through the third quarter and even 23-20 in overtime. They simply couldn’t find the play to pull out their third straight win. Coach Doug Pederson said he thinks the effort is there. Pederson said the Eagles stopped themselves on the two late drives. The Eagles also gave up four sacks, the last with Wentz stripped of the ball setting up a Tennessee field goal early in the fourth quarter. That was the lone fumble of three Philadelphia lost. The Eagles also were flagged eight times for 77 yards. The Eagles also had some dropped passes, particularly Nelson Agholor, who caught only five of the 12 balls Wentz threw at him with four drops. The Eagles couldn’t convert on a pair of third downs late. Wentz threw the ball away on third-and-3 just before Jake Elliott kicked a 30-yard field goal with 16 seconds left in regulation. Wentz said the Titans had them covered, along with some miscommunication. Ertz couldn’t pull in Wentz’s pass on third-and-12 at the Titans 19 in overtime before the Eagles settled for Elliott’s third and final field goal. Ertz said the Eagles cannot simply rely on what worked last season.